I wish…more than anything…more than life…I wish Disney hadn’t worked extra hard to nearly ruin such a beloved show. I knew from the onset of the then-rumors of Disney’s acquisition of the film rights to the Sondheim-Lapine masterpiece, that they ran a risk of mutilating a show’s plot in order to make it more kid-friendly. And, just like the forbidding words of the Soothsayer in Julius Caesar, the worries over this production came to pass as nearly predicted. This is supposed to be a satirical FUNNY stage show; however, nearly all the funny was sucked out of the film adaptation that’s oddly enough already received Golden Globe nominations. The first act is adapted to the screen well enough; but the second act was essentially rewritten–and rewritten badly. If this is the direction that movie studios are moving when adapting smash hit Broadway musicals, then please leave the shows intact on the stage where they can thrive. Stephen Sondheim and James Lapine’s smash hit Broadway musical comes to the screen by Walt Disney Studios and directed by Rob Marshall. The film is about several fractured fairy tales including Cinderella, Jack and the Bean Stalk, Rapunzel, and Little Red Riding Hood woven together with a story about a barren baker and his wife who have been cursed by a witch. The baker and his wife are sent on a mission to bring four items to the witch in order to break the curse. Searching for four items in the mystical woods will bring different fairy tale characters together in a tangled web of lies, deceit, bribery, and death. Filled with beautiful musical numbers and iconic characters, this film takes on the daunting task to bring the beloved musical to a theatre near you. There have certainly been successful film adaptations of wildly popular and long-running Broadway shows. And, sometimes, the film adaptations are better than the stage shows because of the addition of the camera, visual effects, and editing. Some examples of film adaptations of musicals that are arguably better than the originating stage productions are: Chicago, Mamma Mia, Funny Girl, Les Misérables, Annie (and no, not the present incarnation), and yes I’m saying it Phantom of the Opera. However, Disney’s Into the Woods will not make that list. But, it could very well make the list of worst film adaptation of Broadway musicals. For fans of the original show starring the incomparable Bernadette Peters as the Witch, the first half of the movie is pretty well in line with Act I of the show, only missing the entertaining and funny witch, the Baker’s father’s humorous antics, Godmother’s extended dialog, the sexual tension between Red and the Wolf, the playful nature of the Wolf–wait–that’s a whole lot of important material left out. Well, once you get a load of the second half of the movie, you will understand why the first half can be seen as close to the original. The second half of the movie is barely a shadow of its stage counterpart. With very few elements of the second act from the Great White Way remaining part of the film adaptation, Disney essentially reimagined the second half of the film to create a new less memorable or endearing story. The pace of the second half of the movie is way off-step, the story structure is abominable, and the characters are not endearing. Although, it may have added a few minutes to the running time of the movie, the eliminated songs and subplots that were removed in this mashup of fractured fairy tales could have helped to bolster the appeal of the second half. Again, this is supposed to be a funny story. I seldom laughed during the movie. And, let’s talk about the white elephant in the room–Meryl Streep’s Witch. Let’s just say that Streep, for all her accomplishments–and I genuinely believe her to be the greatest female actor of all time, she cannot hold a candle to Bernadette Peters. Peters made the original show with her voice, antics, humor, and effervescence. Streep plays the Witch much darker and far less playful. Although the film was cast pretty well, the screenplay and direction failed to inspire the screen actors to live up to the bar set by the original Broadway cast. 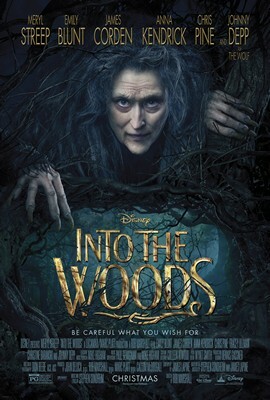 Receiving mixed reviews and a moderate ranking on IMDb, Into the Woods is a failed attempt at translating a Broadway show to the silver screen. The only positive consequence of this production is quite possibly opening up the world of Broadway musicals to a new generation. There has been an increase in screen musicals in recent years: everything from Fox’s Glee to the new film version of Annie, and it’s wonderful to witness musicals becoming more popular and touching people that may not have otherwise given a musical a chance. But, if a timeless show is going to be adapted to the screen, the movie studio undertaking the task should keep the soul of the stage show alive on the screen instead of rewriting it. I enjoyed the movie thoroughly, that being said, I have never seen the Broadway musical, so my opinion doesn’t really matter for the case you are making. I think, however, that for those who have not seen the musical on Broadway the movie was very charming and endearing. Point taken. However, as a movie in and of itself, the second half suffered from the lack of effective direction and a well written screenplay. The first half is enjoyable, the second half was painful to watch.